Filamentous, greatly variable up to 1400 nm in length. Diameter is about 80nm. Negative-stranded RNA linear genome, about 19 kb in size. Encodes for seven proteins. The viral RNA dependent RNA polymerase binds the encapsidated genome at the leader region, then sequentially transcribes each genes by recognizing start and stop signals flanking viral genes. mRNAs are capped and polyadenylated by the L protein during synthesis. RNA editing may occur at NP gene. Attachment to host receptors through GP glycoprotein mediates is endocytosed into vesicles in the host cell by apoptotic mimicry. 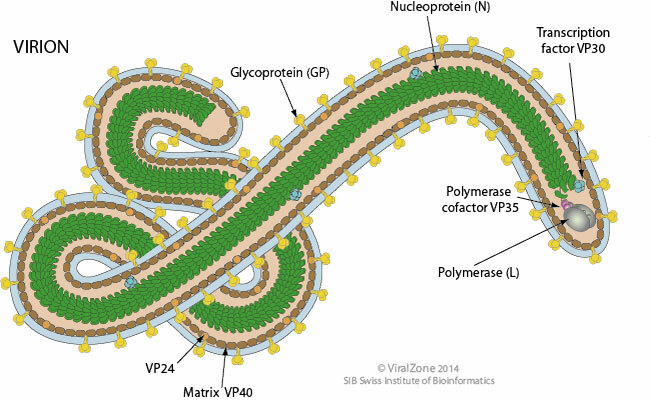 Fusion of virus membrane with the vesicle membrane; ribonucleocapsid is released into the cytoplasm. Sequential transcription, viral mRNAs are capped and polyadenylated by polymerase stuttering in the cytoplasm. The ribonucleocapsid interacts with the matrix protein under the plasma membrane, buds via the host ESCRT complexes from the plasma membrane, releasing the virion. GEOGRAPHY Africa: East Africa, Kenya, Congo and Angola. Cases in Marburg (Germany) and Belgrade in 1967 led to the initial recognition of the disease. They were due to laboratory work using African green monkeys. ASSOCIATED DISEASES Hemorragic fever, often fatal. Vp40 protein prevents interferon signaling by preventing the tyrosine phosphorylation of JAK1 and subsequent phosphorylation of STAT1 and STAT2. .